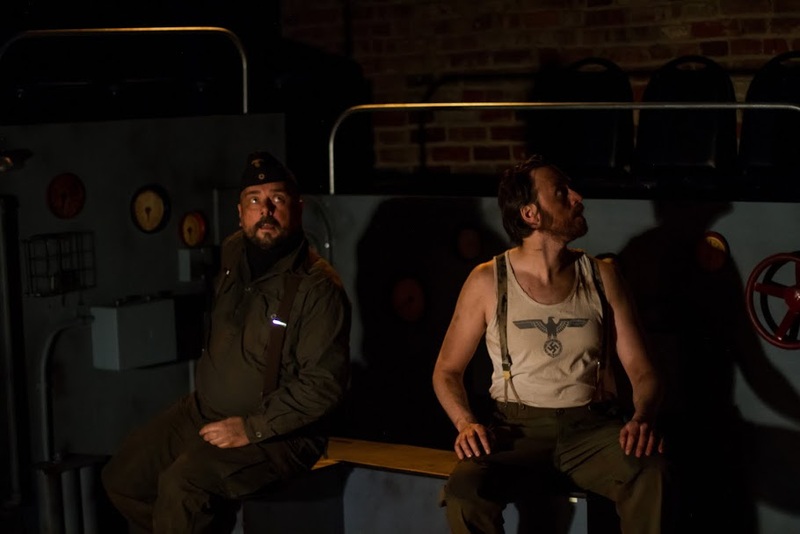 Successfully erasing “the fourth wall” between the actors and the audience, Nat Cassidy, the author and director of “The Temple, or Lebensraum,” turns the stage of The Brick, a small Williamsburg theater, into a World War II German submarine. While the characters dive into the depths, the viewers immerse themselves into the play, sharing the sailors’ nightmares and fears. One cannot help but shudder when the lights suddenly go off, and the sounds of torpedoes pierce the air. All of these features create the impression that there is no escape from the experience. Even the funny intermission announcement that everyone is expected back on board in 10 minutes is only a short gulp of fresh ocean air before the boat submerges again. Since the theater’s interior resembles the inside of a submarine, the audience gets acquainted with the setting even before the play begins. The seats in the front and back of the boat are elevated, while the sides stay on the same level with the actors, and there is a metal railing separating the wooden-floor stage from the viewers. The inside of the submarine is decorated with various nautical equipment. One can lean down below the railing to study or touch one of the devices. The sailors’ tired and smutty faces stare right at the viewers, as though reproaching them for not helping to move the vessel forward. Besides the audience, the submarine crew has one more special guest, an important Nazi officer, Oberführer Karl Heinrich (Matthew Trumbull), whom everyone tolerates but no one welcomes. He is both pathetically sentimental, vomiting after the first attack with him overboard, and ruthless, able to produce the names and addresses of the sailors and their family members without consulting any papers. He is the monster one does not wish to wake, a more imminent threat than the enemy’s ships waiting on the surface. His presence not only upsets the usual order of things on the boat, but also introduces the conflict. As the program explains, those who had a National Socialist party card could not join the crew of such a submarine. Therefore, by fighting in this war the sailors showed loyalty to their country and not the Nazi government, whom they might even despise. As far as the characters of “The Temple” are concerned, they do not hide their dislike for the Nazis. And yet, they submit to the party, embodied by Heinrich. “It’s no way they’ll miss one Nazi,” suggests one of the crew members. “We should have thrown him overboard.” However, no one is rushing to do so for fear of consequences. A powerful party member can be the destroyer or savior. In any case, he is not to be messed with, and on board he remains. While exploring political issues, which the title word “Lebensraum,” or the ideology of German nationalism, does not let us miss, the play introduces us to individuals, representative of various social classes. There is Albrecht Muller (John Blaylock), a man in his 60s, who has seen enough terror and cannot be frightened anymore. There is also Sigmund Zinner (Tristan Colton), who is studying his books in hope of a better life after he comes back from the war. As a crew, the men stick together and help each other. However, as the Nazi party pursues its own interests, it sets a friend against a friend. If the crew does not get it together, they are bound for disaster. Tortured by both real and psychological dangers, the sailors nevertheless preserve their sense of humor and tell each other jokes. Perhaps, the most colorful is that of Weimar Germany. As it turns out, there is a line waiting to go to Weimar hell. As in any other hell, the sinners are first put in the electric chair, then have to lie on a bed of nails, and then a devil whips them. All of this is also done in the Weimar hell; however, there is no electricity. Moreover, someone stole all the nails, and the devil only punches his card and leaves without doing the whipping. This and other jokes lighten up the mood of both the characters and the audience, reminding us that even in the worst of times there’s always something to smile about. Although “The Temple” has a specific political context, even those who do not know a lot about German history will enjoy the play. It is not only the story of Nazi Germany; it is also the story of soldiers, protecting their country and of individuals willing to survive in the face of grave danger. In addition, the setting and sounds draw us into the play, compelling us to relate to the sailors and make their thoughts and nightmares our own. Not every day can we find ourselves on a submarine, and neither can we expect such total immersion from every theater performance. This alone makes Cassidy’s show memorable, engaging and worth our time and attention.